Welcome to Absolute Chiropractic + Wellness! Our office atmosphere is happy and family-oriented. Our bright and fun practice is the ideal place to begin your journey toward optimal wellness. Before you return for your second visit, Dr. Amy and Dr. Erica will have worked together to review your case. 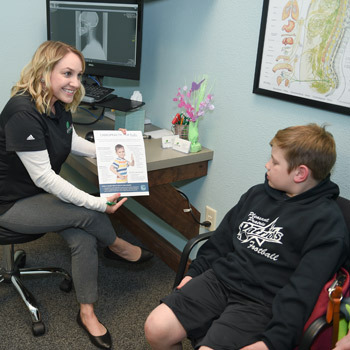 When you come in, your doctor will go through the complete report of findings with you — reviewing all of the exam and X-ray results from the first day. You’ll be given an explanation of what’s wrong and how we can help you. Your financial responsibility will be discussed, and you will then receive your first chiropractic adjustment. Your regular visits will be much shorter at only 5-10 minutes if you are just coming in for an adjustment. If we provide any additional therapies, the visit may be another 15-20 minutes longer. 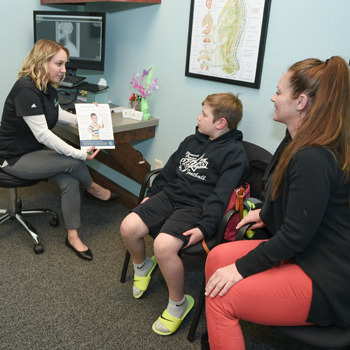 At every visit, our knowledgeable team members will provide helpful information about chiropractic care. We look forward to providing you with a positive experience at every visit to Absolute Chiropractic + Wellness. Book a same-day appointment today. Walk-ins are also welcome.